Jeremy Wong is an accomplished Singaporean pianist and the president of World Piano Teachers Association (WPTA) Finland. Having graduated from Nanyang Academy of Fine Arts (NAFA) from the Diploma in Music as the best graduate (Class of 2009), he continued his Bachelor in Music (Hons) studies at the Royal College of Music which he graduated with a First Class honors in 2013. Besides Classical music, Jeremy is also actively involved in other areas of performing arts such as theatre accompaniment, musical theatre productions, improvised accompaniment and pop music gigs. In 2010, he took on the role of a music director for a local musical production ‘A Word From Our Sponsor’. Since 2015, he has been engaged as a pop and Classical instrumentalist with Cassanova production Oy, Finland. His latest venture was an invited performance trip at Hengyang Radio Broadcast concert hall and Guangzhou, China (2017); a joint improvisatory collaboration to accompany Charlie Chaplin’s silent film – The Kid in cinema Orion (2017); and band coordinator of the annual Independence day celebration in Helsinki Cathedral. For the past few years, Jeremy has devoted much time to experiment with the pedagogics of improvising with different contemporary styles. This includes a three-volume text on Applied Improvisation (2014) and Adult Improvisation Course for Adult learners (2018), that contains pedagogue materials for theory-led improvisations. Apart from this, he has also written two research texts; on an analytical – led performance aspect of selected Schubert’s piano sonatas and the study of formal functions in the Seasons op. 37 by Tchaikovsky respectively. Jeremy graduated from Sibelius Academy with a Masters in music theory in 2017. In addition, he had a successful ‘A level’ professional piano examination under the tutelage of Jarmo Eerikäinen. He studied Jazz piano with Joonas Haavisto and is currently working with Jazz flautist Juhani Aaltonen. Since 2014, he has been the visiting accompanist for Swedish missions choir, Furahakören, and the resident pianist and band coordinator of the Swedish speaking church, Andreaskyrkan. In 2017, Jeremy won third prize in the 7th International piano competition in Milan (Italy). 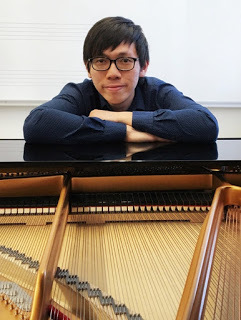 He is presently a part-time piano and theory instructor, and ABRSM coordinator in the International school of music (ISM), and engaged as a research assistant in NAFA, Singapore.